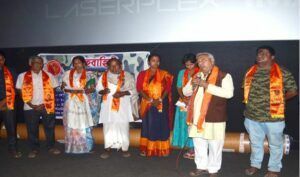 Devdutta plans to make this initiative reach more people across West Bengal; he wants to bring this movie for the people in the other districts of Bangla; their next free-screening of ‘Uri – The Surgical Strike’ is scheduled to be taking place in North Bengal very soon. They lost their family members while fighting for Bharat against the terrorists, yet they don’t lack in patriotism. They may be short on money and lives in faraway villages with minimum amenities but have the ambition to reach the space one day. They are the future of our nation and the strength of Bharat: they are the family members of Uri and Manipur martyrs, people from tribal communities of rural Bengal and hundreds of college students from West Bengal. Singhabahini is the only non-governmental organization in Bengal that has reached out with financial support to the grieved families of both army sepoy Gangadhar Dolui, a Uri martyr, BSF jawan Prosenjit Biswas, a martyr of Rajouri attack and another Indian army sepoy, Abhijit Mandal, a Manipur Ambush martyr. 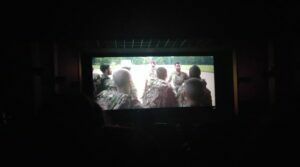 On 7th of February, 2019, a social organization in West Bengal called, Singhabahini organized a free screening of the highly popular nationalistic movie ‘Uri – The Surgical Strike’ in one of the INOX theatre in central Kolkata. The capacity of the hall was 337, but the number of enthusiast young spectators exceeded that. There were at least 200 college students from a very weak financial background from south Bengal, only. 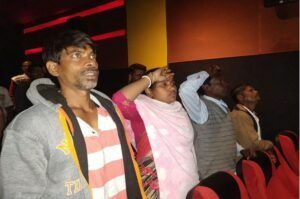 Despite this patriotic movie running for more than two weeks in the theatres, these poor students could not afford to watch the movie on a big screen. But Singhabahini made it possible for them and fulfilled their long-awaited wish. The tens of tribal people, who also lacked this opportunity joined these students. 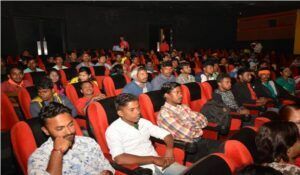 The family members of Uri martyrs and those of Manipur ambush were joined by many ex-servicemen and the devoted workers of Singhabahini in watching this movie on this Thursday. All had a great time enjoying the movie in the Hind INOX theatre. Many were seen spontaneously saluting the bravery of Indian soldiers after their triumph in the surgical strike committed in Pakistan occupied Kashmir soil (picture#3). Devdutta has been part of such nationalist organizational activities from last eleven years and has worked under the supervision of firebrand leader Tapan Ghosh (seen in immediate left to Devdutta in Picture#1). Both Devdutta and his Guru, Tapan Ghosh are working for the empowerment of tribal people, mainly for children and women education in and around Bengal. Singhabahini is the only non-governmental organization in Bengal that has reached out with financial support to the grieved families of both army sepoy Gangadhar Dolui, a Uri martyr, BSF jawan Prosenjit Biswas, a martyr of Rajouri attack and another Indian army sepoy, Abhijit Mandal, a Manipur Ambush martyr. After the movie screening in Kolkata, Barun Dalui, the 18-year-old brother of Gangadhar Dalui told media that he also wants to join the Indian army and fight for Bharat. Members of Abhijit Mandal’s family expressed their heartfelt gratitude to the Indian army for successfully taking revenge for the tragic Manipur ambush. 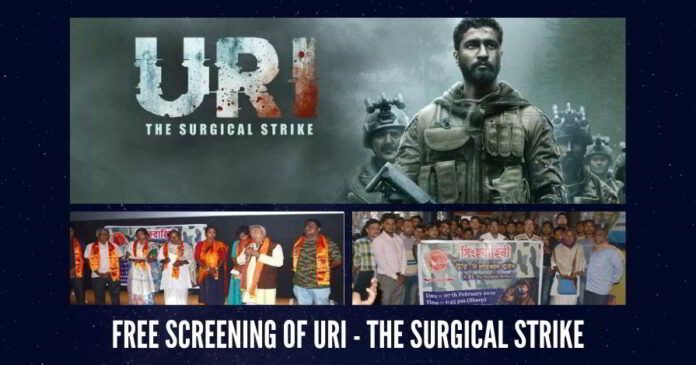 Devdutta plans to make this initiative reach more people across West Bengal; he wants to bring this movie for the people in the other districts of Bangla; their next free-screening of ‘Uri – The Surgical Strike’ is scheduled to be taking place in North Bengal very soon. Singhabahini is determined to maintain its non-political yet nationalist principles while working dedicatedly for the under-privileged sections of our society and bringing the tribal people in the mainstream to the growth-story of Bharat. Next articlePayback time for Mayawati!!! Awesome. This is how it should be.